MANHATTAN — Gabrielle Hurwitz, a recent graduate of Chicago’s Northwestern University, opted to pay a little more for her first New York City apartment — and climb six flights of stairs — in exchange for a lively neighborhood. 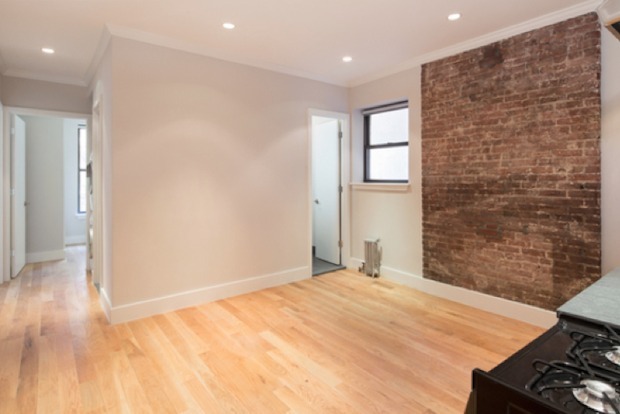 Hurwitz, 22, is dipping into savings and borrowing money from her mother, who co-signed the lease, to cover the $1,600 monthly rent for a studio in an East Village walk-up. "I can always move to the Upper East Side in the future, when I've settled down," said Hurwitz, who is pursuing a career in women's magazine publishing. "For now, I want to be in the action and fun." As recent grads like Hurwitz flock to the city, the competition for entry-level apartments grows fiercer, brokers said. It's essential to be prepared with a realistic budget, the right paperwork and a list of needs, brokers said. It took Hurwitz only a week to find her new digs, working with CitiHabitats broker Mandy Gao, who gave her a checklist. She picked the East Village apartment over a cheaper Upper East Side studio renting for $1,495 a month. "I'm hoping at the very least, [the sixth floor walk-up] can be my personal stairmaster and maybe I'll get in better shape by the end of my lease," said Hurwitz, who faced sticker shock even though she was familiar with New York. As the busy rental season begins, prices are expected to creep even higher, brokers warn. The median Manhattan studio price was $2,300 a month in February, according to a recent market report from Douglas Elliman. The hot neighborhoods of Brooklyn, from Greenpoint and Williamsburg to Park Slope, were not far behind, with a median of $2,260 a month. "It's called the summer rush, but it's also the summer crush," said Jason Saft, of Urban Compass, a year-old, tech-savvy real estate firm that runs a campus ambassador program, sending agents to more than 50 campuses nationwide to prepare students for their arrival in New York. 1. Start your search at least a month before your move. Real estate sites, such as Streeteasy, CityRealty, RentHop and UrbanEdge, can give a lay of the land, but it's also a good idea to tap social networks for leads and referrals. “Typically, landlords know their upcoming apartment inventory 30 to 45 days in advance of a vacancy,” said Michelle Frucht, director of leasing at the Brodsky Organization, which has apartments without broker fees in 80 luxury buildings across Manhattan. 2. Know your budget and credit score. You shouldn't spend more than 30 percent of your income on rent — which might be tough for newly minted grads, said Sang Oh, director of sales and leasing at Platinum Properties. In Manhattan, landlords often have strict income and credit requirements, Oh added. Tenants typically need to earn a yearly salary that's roughly 40 times the monthly rent, so for a $2,000-a-month unit, you need to earn $80,000 a year. To get around this, many new grads have a guarantor — usually a family member — co-sign the lease. The guarantor's income needs to be roughly 80 times the monthly rent, and they need good credit. If you don’t have a guarantor, the company Insurent can fill that role for a fee, said Eric Brown, of Douglas Elliman. Other ways to address lack of credit and salary include paying more upfront — either a year's rent or the first and last month’s rent and two months' security, he said. 3. Have your paperwork ready. Bring your documents — and your guarantor's — whenever looking at apartments, brokers advise. You’ll need bank statements, a “clean and clear copy” of a photo ID and a job offer letter countersigned by both parties, Saft said. He’s seen househunters with letters not countersigned lose apartments to those next line. It's hard to find a studio for less than $1,600 a month in Manhattan, so “sharing is definitely the best way to go," Brown said. Some recent grads put up a wall in a one-bedroom, making it easier to split a $2,000-a-month apartment, he said. If you plan to have roommates, ensure that everyone is on the same page before it's time to ink the deal, advised Cecil Weeks of Miron Properties. You don't want to spend time looking for places, Weeks said, "only to have a roommate that was only half on board drop out of your search." 5. Find a trusted broker. Brokers typically charge a fee of at least one month’s rent. But they also know which owners are friendlier to tenants with no credit history and which landlords will cover brokers' fees, agents said. "If you can stomach the fee, use one," said Weeks, noting that in Manhattan below 34th Street most apartments are listed with brokers. "Why spend hours online perusing fake, old and stale 'listings' when you're likely going to end up paying a broker for simply letting you into a home?" Brokers have access to the same listings, for the most part, so find someone you trust who specializes in your desired neighborhood, said Stephanie Reilly of Keller Williams NYC. "If you have a good enough agent, it should take one or two [outings],” she said. "You should be able to find something in the first eight apartments." 6. Visit apartments during the week. Though some recent grads try to cram in apartment visits during a weekend trip, many buildings will only show units during regular business hours, during the week, Saft said. 7. Know your must-haves and deal-breakers. Is laundry in the building essential? Will you need a pet-friendly home? Is more than three flights of stairs too much? "Be open to more than the hottest and trendiest neighborhoods," Weeks suggested. For example, renters interested in Chelsea might fare better in Murray Hill, and those focused on the Lower East Side should also consider Prospect Heights, he said. Harlem, Astoria and Bushwick have also become hot neighborhoods for recent grads, many brokers said. 9. Spend time in the neighborhood and apartment. Before moving, it’s important to spend time in an area at different times of the day, Saft advised. What is the street like at 7 a.m. when you need to leave for work? Does it feel safe if you’re coming home at 10 p.m.? “If you like to cook, find out if there’s a grocery store nearby or only one 10 blocks away,” he suggested. Make sure you also spend enough time in an apartment to check water pressure, closets and cellphone reception, Saft advised. 10. Wait until after the summer rush is over — if you can. Prices are higher in the summer, so waiting until post-Thanksgiving sometimes helps. "Generally apartment seekers can find lower rents and more incentives, if any, in the winter months,” Frucht said, referring to deals with a free month’s rent or no fees. “On the flip side, there aren’t as many available apartments in the winter months as there generally are in the summer/spring seasons."